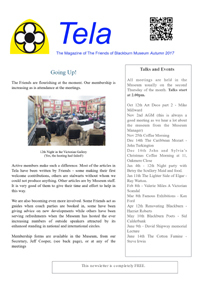 Our newsletter is sent out to all our members. Membership is just £10 per year and you can join us here. Or, just click here to view or download the current newsletter (in pdf format). Note: this will open a new window on a different site. Paul Flintoff is taking early retirement. David Shipway, Blackburn Cotton Exchange, Tigrane the Great of Armenia, Botticelli, Gerrit Dou and more! There are many examples of items we have sent to be restored or conserved with the help of the Friends and they have come back in much better condition. But what’s the difference? Read about the issues in the November newsletter. The main article concerns the identification and condition of a painting found in the stores. What should be done with it? There is also a look at a cuneiform tablet in the Hart Gallery which tells a fascinating story of bull sacrifices. This is an investigation into one of the major holdings in the Hart collection, The Mirror of the World, an early printed book.